Cain isn’t fond of that gesture. CNN’s Republican presidential debate focusing on foreign policy and national security lacked the fireworks of some previous GOP showdowns, but here’s what it did include: Mitt Romney getting his own name wrong, Newt Gingrich being nice to illegal immigrants, and Jon Huntsman getting sassy for once. As a service to you, the busy/somewhat indifferent reader, we have neatly summarized the highlights below. Biggest Insult: Being called “highly naïve” by Michele Bachmann, as Rick Perry was during a debate over foreign aid to Pakistan. Most Inexcusable Inaccuracy: After Wolf Blitzer quipped that “Wolf” is his real name, Mitt Romney replied that his first name really is Mitt, which is not true. It is Willard. Other Most Blatantly Inaccurate Statement, Aside From Mitt Romney Misstating His Name: “Almost every decision that the president has made since he came in has been one to put the United States in a position of unilateral disarmament, including the most recent decision he made to cancel the Keystone pipeline.” —Michele Bachmann. Obama did not cancel the pipeline, he delayed it while an alternate route is investigated. Most Misused Term: Blank check, which is allegedly what we’re giving to Pakistan in foreign aid. In reality, we are giving them finite amounts of money. Worst Filter: Michele Bachmann may have leaked classified information on terrorist attacks against Pakistani nuclear sites. Or she might have just made it up. Most Condescending Newt Gingrich Moment: The discussion taking place about whether to withdraw from Afghanistan was too “narrow” for Gingrich to participate in. 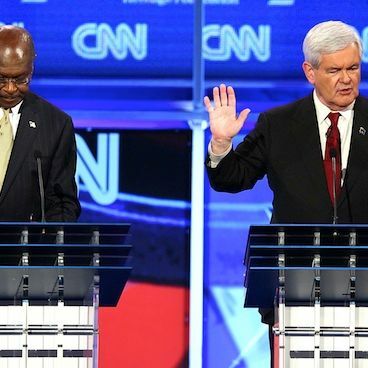 Biggest Question Mark: Will Gingrich face a backlash over his amnesty-ish position on illegal immigration?